This new San Ildefonso water jar is brilliant. 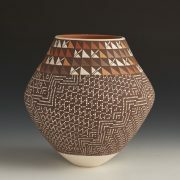 Working on a theme of very old style forms and designs, Russell has recreated a magnificent jar from olden times. 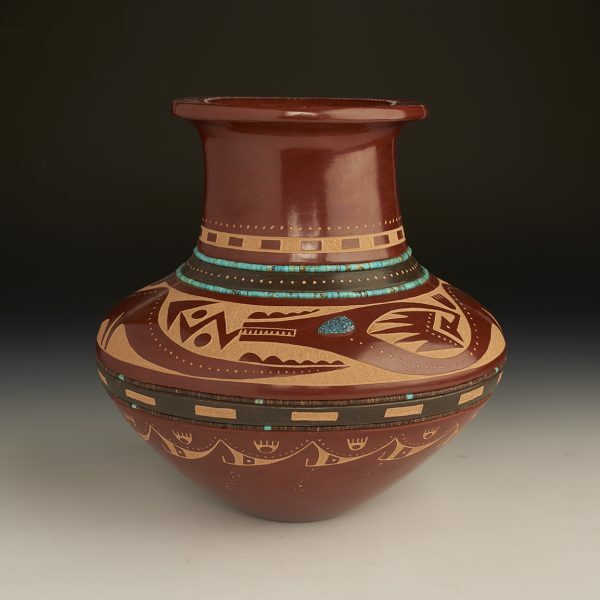 His sgraffito work shows his interpretation of many of the design elements. 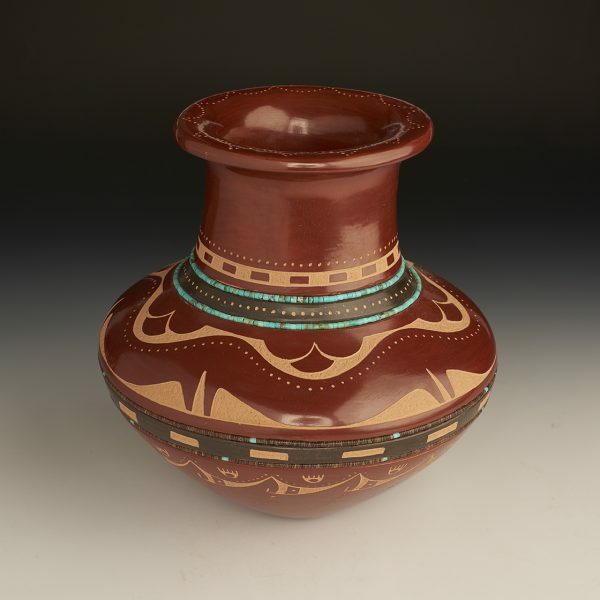 Russell is using a very deep clay slip that was used in San Ildefonso in the 1920's and 30's. The coloration of red, black, and tan reminds us of the historic polychrome pottery. From top to bottom, the entire jar is polished. There is a checkerboard pattern on the neck of the jar as well as the area below the water serpent. 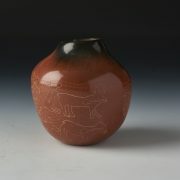 Incised into the clay, on the broad shoulder is the avanyu. Notice how the tail wraps around the entire jar, and flows back to the head and mouth. The bottom quadrant of the jar shows more complex incised design work. Bear paws, dots, and flowing symbolic imagery shows movement. Four strands of super fine Heishi (turquoise and natural shell) are embedded into the clay. 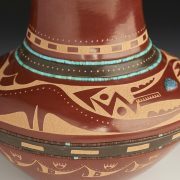 The polished neck leads up to a beautifully polished lip that also has an incised dot pattern. Russell has polished several inches, deep into the neck of the jar – an incredibly arduous task to achieve! 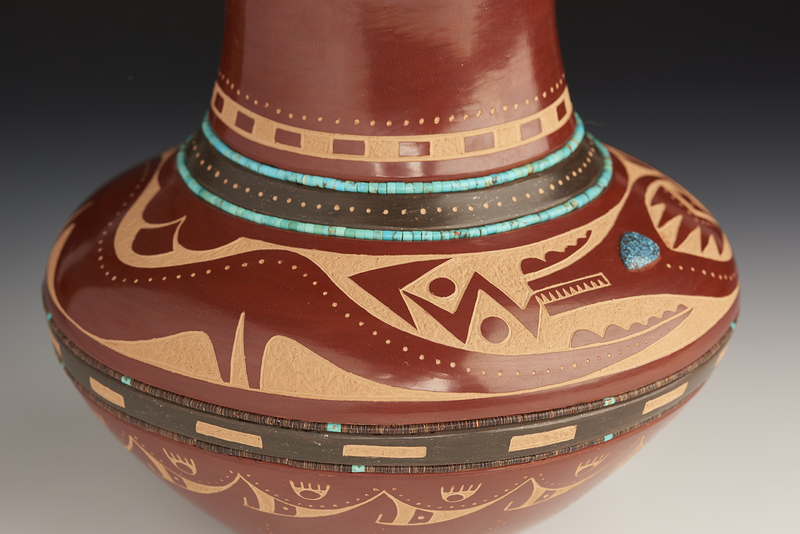 The eye of the serpent is accented by a gorgeous high-grade Lone Mountain turquoise stone. Everything on this piece is so well conceived and defined, and so well balanced. Every element has its place. This is a remarkable new jar from Russell.